Located in Philadelphia, Pennsylvania, the Rodin Museum commemorates the work of famed sculptor Auguste Rodin and is part of the Philadelphia Museum of Art museum network. Born November 12, 1840, François Auguste René Rodin is widely considered to be the forefather of modern sculpture. As a classically trained sculptor, Rodin’s early work struggled to find a critical audience, and his 1875 work Age of Bronze, inspired by the works of Italian Renaissance artists Donatello and Michelangelo, was brought under scrutiny for accusations that he had forged the work by using a cast of a live model. Commissions and collaborations throughout the late 19th century brought him to prominence within the European arts community, however, and his most notable works, including The Thinker, The Kiss, and The Gates of Hell are now considered among the greatest sculpture pieces of the modern era. Today, Rodin is one of the most well-known sculptors in the broader popular culture sphere, celebrated for his realism in depicting the human body through sculpture, a departure from the traditional themes of mythological figures depicted by many Renaissance-era artists. Philadelphia’s Rodin Museum was a gift to the city by Jules Mastbaum, a local movie theater magnate and philanthropist and avid collector of Rodin’s works throughout the latter part of his life. Mastbaum commissioned architects Jacques Gréber and Paul Cret to create a museum for the city of Philadelphia to display his collection, which broke ground on construction in 1926. The museum was intended as part of the newly-constructed Benjamin Franklin Parkway civic corridor, which was conceived to mimic Paris’ Avenue des Champs-Élysées and also housed the Philadelphia Museum of Art and the Free Library of Philadelphia. Though Mastbaum died later that year, his museum was finished and opened to the public three years later, in 1929. During the 20th century, the museum’s collections were expanded to encompass works by other artists, but in 2012, the museum underwent a three-year major renovation that refocused its collection back to its original mission of displaying Rodin’s works. 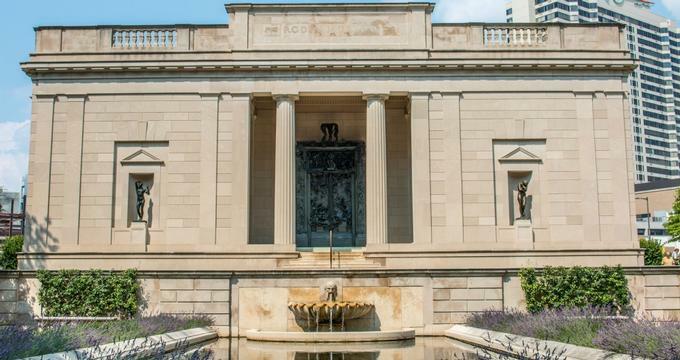 Today, the Beaux-Arts-style Rodin Museum is considered to be one of Philadelphia’s greatest cultural landmarks, housing one of the largest and most comprehensive collections of the artist’s work outside of France. The museum is owned and operated by the Philadelphia Museum of Art, which is located next door as part of the Logan Circle open-space park and civic district. The museum is listed on the Philadelphia Register of Historic Places and attracts more than 400,000 annual visitors. More than 140 works by Rodin are showcased at the museum, including a cast of his most famous piece, The Thinker, which is located outside the museum on a pedestal within the entry courtyard area. Originally conceived as part of Rodin’s larger Gates of Hell work, The Thinker was initially designed for an 1880 commission, inspired by the characters and scenes of Dante’s Divine Comedy. Though debates in the artistic community continue to be waged as to whether the sculpture is intended to convey the likeness of Dante himself, Rodin stated that the piece was intended to evoke a classic Renaissance heroic figure and represent the concepts of intellect and poetry. The piece was first cast as a large-scale bronze sculpture in 1904 and has since been recreated over 28 times. The museum’s interior rooms house a number of replicas and casts of Rodin’s most famous works, including a 1929 copy of his 1886 piece The Kiss, specially commissioned for the museum by Mastbaum prior to its opening. One of three original copies of the 5.5-meter bronze doors of The Gates of Hell, which serves as the main section of Rodin’s most defining work of his career, are also showcased. Other notable works on display include Eternal Springtime, The Burghers of Calais, Youth Triumphant, and Monument to Balzac. Outside the museum, eight works are showcased within the museum’s landscaped gardens, including The Age of Bronze, The Three Shades, and Eve. Admission to the Rodin Museum is on a pay-what-you-can basis, with donation amounts suggested for adult, student, and senior visitors. Two-day and combination tickets with the Philadelphia Museum of Art and its other properties are also available. Daily guided tours are offered, showcasing the artist’s works and elaborating on their histories and creative processes. Guided and self-guided field trip opportunities are also available for elementary and secondary school groups, incorporating Pennsylvania curriculum elements in the areas of language arts, art, social studies, and French. A monthly Second Saturday Sketch program also allows visitors to bring their own sketchpads to the museum to complete works inspired by Rodin’s sculptures.